It is more than your ceiling. It is your fifth wall. Shift your outlook and look up to your ceiling to open up creative design opportunities. Skylights provide a natural, balanced light from above that promote a healthier environment including daylight and fresh air and reduces our dependence on air conditioning. Also, as we age, we find we need more light. Skylights provide a soft natural light that benefits eyes of all ages. Which skylight is right for me? Whether you are looking for additional daylight or the combination of daylight and fresh air, we have a skylight for your particular situation. We offer a wide variety of fixed, manual venting or solar powered venting skylights. 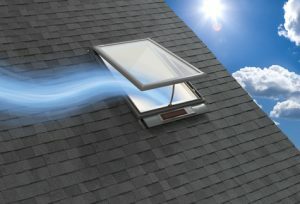 A solar powered venting skylight? 30% tax credit? Tell me more! This innovative skylight uses the power of the sun to open and close. A small solar panel on the exterior of the skylight captures daylight that charges a concealed battery. Even on cloudy days, the solar panel will continue to charge. If you have your skylight open and it begins to rain, the rain sensor will automatically close your skylight. And the best news of all: the solar powered venting skylight qualifies for a 30% Federal Solar Tax Credit on all materials and labor!